MTC’s original musicals offer unique opportunities to young actors to be in a small cast, receive featured solo singing and acting lines, and explore new and innovative storylines as an alternative to “mainstream” productions. Scroll down for a synopsis and musical slideshow! 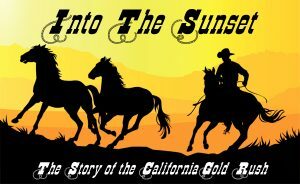 Into the Sunset tells the dramatic story of the California Gold rush! Many of the characters in this musical are real people! James Marshall, William Sutter, Levi Strauss, Lotta Crabtree, Mary Ann Crabtree, Henry Wells, and William Fargo all made history during the Gold Rush. During the Gold Rush, Levi Strauss invented the now-famous “Levi’s” jeans for the miners, Wells and Fargo founded the Wells Fargo bank to serve the miners, and Lotta Crabtree, with the help of her mother Mary Ann Crabtree, went on to become the most famous female entertainer in America the late 1800’s. The Claytons and the cowboys are fictional but represent people of the gold rush era. Word spread, and it spread fast! A family from Pennsylvania, the Claytons, decided to pack up everything and move to California in search of gold. The fateher, Jesse Clayton thinks that he’ll finally get rich (Song 2: I’ll Get Mine). The mother, Sadie Clayton, is sad about leaving, but agrees with Jesse that it’s time to try something new. Sadie sings sadly, but with hope, looking to the days ahead (Song 3: Into the Sunset). The Clayton’s daughter, Libby, is unhappy to be leaving her home, and her friends, but finds hapiness in giving her mother a packet of wildflower seeds to take along so that they can enjoy familiar flowers in their new home. Word even spreads to New York City where businessmen see an opportunity to prosper in the West! A young man, Levi Strauss, sells canvas and other goods in New York, and when he reads about the gold rush in the newspaper, decides to go to California to sell tents to the miners (Song 4: Something’s Gonna Change). Businessmen Henry Wells and William Fargo decide to head west to start a bank for the miners (Song 5: Money). When the Claytons, Preston, and Miley arrive in California at the end of their long journey, they are greeted by Sutter, who has become greedy and is not happy about all the “would-be miners” who have come to mine gold on “his” land! Fortunately, the Claytons are welcomed warmly by Wells and Fargo (who offer their bank services), Levi Strauss (who offers to sell them tents). They are also welcomed by the six-year old entertainer Lotta Crabtree and her mother, Mrs. Mary Ann Crabtree, who runs the local Inn and invites them over for their first good meal. Levi even gives Lotta a small piece of canvas to replace her doll’s torn dress. Jesse Clayton finds no gold in his first days mining, telling Sadie and Libby that they were “too late.” Libby wishes that they had never left home (Song 8: Broken Promises). Seeing Libby sad, Lotta invites Libby to her mom’s Inn to cheer her up. Lotta’s mom, Mary Ann, feeds the hungry miners in the Inn while Lotta sings to everyone’s delight (Song 9: Make Yourself at Home). Afterwards, Libby is still sad, and Lotta tells her that she, too, had come from far away and misses her home. Lotta comforts Libby (Song 10: Leave the Night Behind). Libby visits the Crabtree’s Inn one last time to thank Lotta and tell her the good news, that she is going home! While at the Inn, Sutter is talking to Marshall. Sutter tells Marshall that the miners are “taking land and gold that should be mine.” Marshall does not agree with Sutter – he thinks that everyone is entitiled to some riches – and Sutter breaks off their long-time friendship. Fargo sees the encounter, and sings of the heartbreak that gold has caused (Song 11: Land of Golden Dreams). After they Claytons have left for home, Marshall is alone by the streambed, sad at the loss of his friendship with Sutter. As he runs his fingers through the sandy streambed, he looks under a rock and finds another gold nugget! At first he is excited, but then realized how gold cost him his friend (Song 11: Take that Gold, Give Me Back My Friend). Marshall buries the nugget back beneath the rock.